4:14 pm ET - Checkered flag on qualifying. The No. 92 BMW is on the GT2 pole for Mosport with a 1:17.528. The No. 90 BMW is P2. The No. 87 is P3. The No. 4 Corvette is P4, the No. 3 Corvette is P5 and the No. 45 is sixth. In the No. 44, Johannes had the ninth fastest time - they used the session for setup because the car will start from the rear of the grid. We'll be back with you tomorrow for morning warmup at 9:15 am ET. See you then! 4:05 - Patrick is back out for one more attempt at a fast lap. 4:00 pm - The No. 92 BMW is now P1 with a 1:17.528. Patrick is P6 right now. They will pit him for tire pressures. The No. 44 is using the session for setup since they will automatically start from the rear of the grid because the car's second driver, Darren Law, will not arrive until late tonight and wasn't able to participate in the official practice sessions today. The No. 62, which crashed late in the practice session, has not yet made it back from the garage. If they do not participate in qualifying, they will also start from the rear of the grid. 3:58 - On his second lap, Patrick is P3. The No. 4 Corvette is P1; The No. 3 Corvette is P3. 3:53 - Green flag on GT2 qualifying. The No. 45 just went out on track. The No. 44 is in the pits as they make one more setup change. The track is dry and the cloudcover has startd to disperse. 3:46 - Checkered flag on the final practice session. GT2 qualifying will start shortly. The No. 45 was P6 in the session, the No. 44 8th. The No. 92 BMW was P1, the No. 90 BMW P2, the No. 62 Risi Ferrari P3 (it crashed late in the session), and the No. 4 Corvette P4, the No. 87 Farnacher Loles Racing Porsche P5. 3:35 - Green flag - 11 minutes left in the session. 3:33 - We are seeing the No. 62 on a rollback - quite a bit of damage to the left rear. The car is heading back to the paddock. 20 minutes until qualifying session begins. 3:26 - Red flag. Looks like the No. 62 has stopped just off course after impacting the wall - can't tell how much damage. Driver appears OK.
3:22 - Patrick pits for new tires. Just over 20 minutes left in the session. 3:20 - Patrick Long is now in the No. 45 - he's P5. Johannes is still P8. 26 minutes left. 3:10 - Joerg is now P3. Johannes is P8. 35 minutes left in the session. 3:00 - Johannes is in the pits for a setup change. Joerg heads back out. 2:54 - Joerg is in the pits for the crew to get a read on the car and some more detailed feedback from Joerg. Because of the rain this morning, we didn't get much done on setup so this is our last chance before qualifying to make setup adjustments. It's hard to tell what the weather will hold for tomorrow, but right now it looks like it will be a dry race. 2:50 - Joerg is P4 after 4 laps. The No. 4 Corvette is P1, No. 92 BMW P2; No. 3 Corvette P3. Johannes is P 7. 2:46 - Green flag. The session will run for the full hour. 2:43 - We are on a hold while they do repair to the tire wall (from an incident in the previous session). 2:35 pm ET - Five minutes from start of the second practice session for today. We had some luck on the weather and the track is dry and it looks like it may hold for the sesssion. Joerg will start in the No. 45 and Johannes in the No. 44. Johannes' co-driver Darren Law will arrive here late tonight after his race at Montreal today. Because Darren won't make an official practice session, the No. 44 will start from the back. There are a few other cars in the same situation (the No. 87 Farnbacher Loles is one) so the starting position will be determined by the times set during the two practice sessions today and qualifying (also today). 11:10 - 5 minutes left in the session. It's now raining solidly. Joerg now has the fourth fastest time of the session with a 1:33.510. Johannes is 10th. 11:00 - 15 Minutes left in the morning practice. Joerg Bergmeister is now in the No. 45, which has the 8th fastest time of hte session. Johannes is in the No. 44 which is 10th. The track has been wet the entire session, although it is only raining lightly the fog has not lifted. 10:45 am ET - We are back to the in-between conditions again - not really wet, but not yet dry. The No. 3 Corvette, which I believe is still on rain tires, is fastest in the session with a 1:32.864. 10:30 am ET - Patrick is now P4. Johannes is P9 in the No. 44. The No. 4 Corvette is P1 and the No. 3 Corvette P2. The No. 62 Risi Ferrari is P3. Johannes is back in the pits for the engineers to work on rain setup, since there's not much we can do for dry setup at the moment. 10:27 am ET - Patrick is fifth fastest in the session right now - with a 1:38.621. 10:23 am ET - It's definitely raining now. Both cars are still out, now on rain tires. Everyone is being very cautious - visibility is very low. 10:00 am ET - Good morning from Mosport. It's cool, foggy and wet here this morning after a heavy rain last night. The track is starting to dry out - not quite there. The session starts at 10:15 am. The engineers are still deciding what tires to start on - there is almost a dry line, but not quite - too dry for wets but possibly still too wet for slicks. 5:53 - Johannes is in the pits in the No. 44 and Patrick is out again in the No. 45. The No. 45 is P6 in the session. The No. 62 is P1, the No. 4 is P2, the No. 90 is P3, the No. 87 is P4 and the No. 40 is P5. 5:50 - Patrick reports a weird vibration. He will pit this lap to have the crew check it out. 5:45 - Patrick pits for an aero adjustment. 15 minutes left. The No. 45 is still P5. 5:38 - The No. 45 is in the pits for a setup change. The rain has held off and it looks like we may luck out for the session. 20 minutes left. 5:30 - Johannes heads back on track after the setup change. It's now GT2 only. Patrick Long is still in the No. 45. The No. 45 is P4 in the session. The No. 62 is P1; the No. 4 is P2; the No. 90 is P3. 5:25 - The No. 90 BMW is now P1 with a 1:18.313. Patrick Long is now in the No. 45. Johannes is back in the pits in the No. 44 for a change. His co-driver Darren Law is doing double driving duty this weekend and will not be at the track until Sunday morning warmup. As a result, the No. 44 will start from the back of the grid on Sunday. 5:12 - Joerg pits for driver change and fuel. 5:05 - Joerg is in the pits and is reporting turn by turn feedback to the engineers. He is now P1 in the session with a 1:18.572. Craig Watkins calls the No. 44 into the pits for a read on the car and then make a setup change. 5:00 - Joerg heads back out. He is now in P3. 1 hour left in the session. In the No. 44, Johannes has moved up to P7. 4:55 - Joerg reports more rain. He is called back into the pits for a setup change. 4:52 - Joeg is now P2 with a 1:19.166. The track is dry again but tV shows it is still sprinkling. 4:45 - The No. 45 is back on track and the No. 44 should be out shortly. Wolf Henzler in the No. 87 is in P1. Dirk Mueller in the No. 92 BMW is P2. Joey Hand in the No. 90 is P3. Joerg is P7. 4:41 - Johannes and Joerg both radio in that it is starting to get slippery as it is now raining lightly. Chief engineer Craig Watkins (working on the No. 44 Porsche) and No. 45 engineer Stefan Pfeiffer make the decision to pit each cars. 4:38 - Some sprinkles on the front straight. 4:36 pm - The No. 45 is in the pits after its fuel check. Joerg reports that the pads are not yet in, but they'll add fuel, and send him out again to get the pads bedded and the tires up to temp. Joerg's initial report after just 3 laps is that the car is stiff and bouncy and harsh over the bumps. Joerg is P4 right now in the session, which lasts until 6 pm ET. 4:35 - After an install lap, the No. 44 is in the pits, and back out again. 4:30 - Green flag on the combined GT2/prototype test session. 4:25 pm - Good afternoon from Mosport. It's a breezy cool day here and we have a weather front coming in with rain scheduled for later tonight. It's been dry so far and hopefully we'll have a dry test session - starting at 4:30 pm. Joerg Bergmeister is in the No. 45 and Johannes van Overbeek is in the No. 44 - ready to head out on track for their first track session of the race week. Stefan Pfeiffer just nofified the crew of the schedule for the session - they'll start with an install lap, bedding in the brake pads and make sure everything is sorted out before starting their setup work. In the No. 44 Johannes will do an install lap and also work on bedding in brake pads and shaking down the newly installed motor. 4:50- Checkered flag. The No. 45 is fourth and the No. 44 is eighth. Although we did not finish in the podium, the No. 45 finished ahead of the No. 62, which is fifth, so we will extend our championship lead. 4:48 - The No. 3 Corvette is now by - that was a shovel move - going on the inside and pushing Patrick off course. Luckily Patrick was able to keep control and continued. Patrick is now P4. In the No. 44 Darren is now P8. The Ferrari is P5. 4:46 - Patrick is by the No. 4 Corvette, but so is the No. 3 Corvette which is now right on his tail. just under 3 minutes. 4:45 - The No. 62 was passed by the No. 4 Corvette. Patrick in the No. 45 is in third and is now in a Corvette sandwhich - between the 4 (which is one lap down) and the 3 which is in fourth. 4:42 pm - Green flag. 4:40 pm - Less than 10 minutes left. Still yellow. 4:39 - Correction - looks like the 3 passed the No. 62 under yellow because they've now reversed positions - the No. 62 is back in fourth and the No. 3 in fifth. We are still yellow. Physically on track, the No. 45, in third, is followed by one of the BMWs (the 90, the leader) who is one lap ahead. The No. 62 is right behind the BMW. In front of the No. 45 is the No. 92, which is in second. 4:32 pm - Another full course caution, 17 seconds to go. The issue here may be fuel - many cars would have taken short fuel on their last pit stop - a lengthy yellow could cause problems. If the race finishes under yellow, we will finish third. The No 3. Corvette passed the No. 62 Risi Ferrari right before the yellow to move into fourth. Positions: P1 No. 90; P2 No. 92; P3 No. 45; P 4 No. 3; P 5 No. 62; P 6 No. 4; P 7 No. 40; P8 No. 44. 4:27 - The No. 87, which was in eighth, evidently is having som eproblems, Darren is now P8 in the No. 44. 4:25 - Positions: P1 No. 90; P2 No. 92; P3 No. 45; P4 No. 62; P4 No. 3; P 6 No. 4. The No. 44 is P9. The No. 90 is on the lead lap. The No. 92, 45, 62, and 3 are on the same lap, one lap down from the No. 90. The No. 4 is one lap down on them, 2 laps down on the leader. 4:22 - 25 minutes left. The No. 45 is P4. We are right behind the No. 62 and Patrick is past him to take third. The No. 62 is P4. On their last pit stop, Risi did not take new tires but the No. 45 did. 4:19 - Patrick is now P4. The No. 90 is P1. The No. 62 is P2. The No. 92 is P3. The No. 45 is P4. The No. 3 is P5 and the No. 4 is P 6. The No. 62, 92, 45, and 3 are all on the same lap. I believe that the No. 4 is one lap down from them (2 from the leader). 4:18 pm - Still yellow. Risi did not take tires on their pit stop. I'll report positions in a minute once things sort out. 4:17 pm - Patrick is out of the pits ahead of the No. 90 and the No. 3 corvette. We have lost all pit cameras so I can't tell what's happening. I'll update in a minute if we get things back. 4:14 - The No. 62 Risi Ferrari crew is getting ready for their pit stop. The No. 92 (in second) is also pitting - they are P2. The No. 44 is in pit lane for short fuel and tires. The No. 45 will also pit for short fuel and tires. 4:12 - The waveby has started. It looks like the No. 15 P2 car, which beat out the No. 9 and the No. 66 out of the pits, is now the overall leader. 4:08 - The No. 1 and the No. 2 overall cars pitted and are back on track quickly in the same order (No. 9 is P1, No. 66 P2). Once the waveby starts (at the end of the yellow), the pace car will wave the field by until the No. 9 reaches the pace car. Both the No. 44 and the No. 45 will pit during this yellow - I expect much of the GT2 field will also pit. 4:02 - One of the dyson prototypes was slow on course. he was working his way around slowly when the Panoz hit him on track, spinning off into the grass. We were able to avoid the incident. Full course yellow. Hopefully we will have some luck on this yellow and the restart. 4:00 - 50 minutes left to go. We are P5. 3:57 - The No. 90 BMW passed the No. 45 on the front straight, but he is a lap ahead and it was not for position. The BMWs have more power than the Porsches (they are running a larger restrictor) and at a track like Road America this is a significant advantage. 3:52 - Here are the positions in GT2. No. 90 BMW is in the lead. He is on the lead lap. No. 92 BMW is in second. He is on the same lap as the No. 90. The No. 62 is in third. He is one lap down on the BMWs. The No. 3 Corvette is in fourth. The No. 45 is in fifth and the No. 40 Ford GT is in sixth. All four of those cars (the No. 62, No. 3, No. 45, and the No. 40 are on the same lap). The No. 4 Corvette is in sixth ( I believe that the No. 4 is 2 laps down on the overall leader). 3:50 - No. 87 is in the pits for fuel and tires. They should be good for the rest of the race. They are now in 8th. No. 44 is in 9th. 3:47 -Patrick has been trying to get by the No. 3 Corvette (whic is in fourth) , but has been unable to get safely by - Patrick is on a faster pace. 3:43 pm - The No. 4 Corvette is in the pits unexpectedly. They are fueling and it looks like replacing the door becuase they lost a mirror during the incident with the Dyson car earlire. The No. 4 had been in fifth. The lengthy pit stop has pushed him back in the field and Patrick in the No. 45 moves to fifth. 3:33 - Patrick has passed the No. 90 BMW on track that puts him back on the same lap, but is not for position. Still P6. He now needs to reel in the No. 4 Corvette in fifth and the No. 3 Corvette in fourth. Replay shows one of the Corvettes making contact with a Dyson prototype and the two Corvettes touching on track as a result. No apparent damage, but it did slow them down a bit and Patrick is now right behind them. 3:26 - Chaos in the GT2 lead pack - looks like we got caught up in the tussle - the Ferrari took advantage of the traffic to pass the pack, with both Corvettes following him through. This puts the Ferrari into third. Patrick went wide and was able to avoid contact or damage to the car, but is now in sixth (from third). Positions: p1 No. 90; P2 No. 92; P3 No. 62; P4 No. 4; P45 No. 3; P6 No. 45. Both BMWs are still one lap up, gained during the first yellow, when they got the waveby, but the rest of the GT2 field did not. 3:24 - Green flag. Positions: P1 No. 90; P2 No. 92; P3 No. 45; P 4 No. 62; P 5 No. 4; P 6 No. 3. No. 44 is now P 9. 3:21 - Fantastic pit stop by the No. 45 crew - the No. 45 beat the GT2 leaders (who were on their outlap after their pit stops) out on track. That puts him into third - ahead of Risi, now in fourth, and the Corvettes in fifth and sixth. Patrick Long is in the car. 92 was assessed a penalty - stop and go plus 60 seconds- for a problem in their pit stop. Still yellow. 3:21 - No 45, currently in third, is now in the pits for driver change, tires and fuel. I'll report positions in a few minutes once the field settles out. 3:19 pm - Risi beat the pitting GT2 cars out of the pits. This means that he has passed the Corvettes, and has held off the BMWS, which are in the lead, from gaining another lap on him. 3:17 pm - The wave by has started - the pace car waves the field by until the overall leader (the No. 9 Patron prototype) reaches the pace car. Then the waveby stops. Joerg was second in the line behind the pacecar when the waveby started - he and the rest of the GT2 field all got the waveby and are now circling back around. He did not gain a lap back on the BMWs (they are still in the position that they were when the yellow started) but at least he didn't lose a lap. Most of the GT2 field is now pitting - both Corvettes, both BMWs, the Viper, the Ford GT, and Risi. The No. 45 will pit on the next lap. 3:09 pm - The pace car is out - we'll see in a minute how things sort out, once the pace car catches the overall leader. The pace car is physically in front of the No. 3 Corvette, with the NO. 45 next, the No. 4 next, and the No. 62 behind him. 3:05 pm Double yellow - car off in six. We were starting to get ready for our driver changes - this will mean we'll stop earlier than planned. Looks like the No. 11 Viper in the gravel. This yellow could help us - depending on where we are on track to the overall leader, we may be able to close some of the distance to the BMWs, and close up the gap to the No. 3 Corvette which is P3. 3:04 pm - The overall leaders are threading their way through the GT2 field, spreading them out a bit. Joerg reports that the car is squirrely and wiggly, and that there might be a problem. 3:02- The No. 87 Farnbacher Loles Porsche is in the pits. Joerg is now 2 seconds back from the No. 3 Corvette. Joerg is still P4. 2:58 - The No. 45was able to use some Challenge car traffic to get a bit of breathing room from the No. 62 Risi Ferrari and the No. 4 Corvette. In the traffic - the the No. 4 Corvette was able to get by Risi. This helped us - giving us a bit of a gap. Positions: P1 No 92; P2 No. 90; P3 No. 3; P4 No. 45; P 5 No. 4; P 6 No. 62. 2:53 - The No. 3 Corvette is by Joerg and has taken P3. Joerg now P4. the No. 62 is now just behind Joerg. 2:51 - GT2 Positions remain unchanged. P1 No. 92; P2 No. 90; P3 No. 45; P4 No. 3; P 5 No. 62; P 6 No. 62; P 7 No. 87. No. 44 P10. 2:43 - Joerg is under pressure from the No. 3 Corvette which is in P4 and behind him, the No. 62 Risi Ferrari which is P5. 2:40 pm - Joerg is running at the same pace as the BMWs, but they are one lap ahead. Positions: P1 No. 92; P2 No. 90; P3 No. 45; P4 No. 3; P5 No. 62; P6 No. 4. The No. 44 is P 10. Just over 2 hours left. 2:35 - Green flag. Very congested out there as the prototypes that are physically behind the GT2 cars work their way up. Joerg still holds P3, with the No. 3 Corvette right behind him and the No. 62 Risi Ferrari right behind the Corvette. Luckily it was a clean restart. 2:34 - yes, that's confirmed - Joerg is at the head of the line behind the pace car, just behind the Patron prototype. This means that the GT2 leaders, the No. 90 and 92 were able to gain nearly an entire lap on the field during the yellow. 2:32 - The No. 92 BMW pitted for fuel - still a yellow flag. Unfortunately, it looks like Joerg and all of the GT2 cars behind him got split by the pace car - this puts the No. 90 and No. 92, who were in front of the pace car, one lap ahead of the rest of the field. I'll confirm that in a minute. Still yellow. The No. 90 MBW also pitted for fuel, and came out just behind the No. 92. 2:20 - Joerg radios in that he was hit but he is continuing. Not sure yet what happened. Still double yellow. Joerg said it was a pretty big hit but the crew who went to the pit wall said the car looked ok.
2:18 pm - The No. 62 Risi Ferrari has passed the No. 4 Corvette. Positions: P1 No. 90; P2 No. 92; P3 No. 45; P4 No. 3; P5 No. 62; P 6 No. 4. Local yellow as a challenge car is deep in the gravel in Turn 12. Now full course caution for race control to remove the car. 2:22 - The top 5 GT2 cars are running close together - the 2 BMWs, followed by the No.45, followed by the 2 corvettes. And Risi has caught up and is in P5. Joerg is battling a bit of understeer and a the BMWs are building a bit of a gap to him. 2:06 pm - It was a fairly clean start for the field except for the Panoz, which sustatined damage after colliding with the No. 40 after it apparently spun at the start. In the No. 45, Joerg was able to retain his starting position. Positions: P1 No. 90; P2 No. 92; P3 No. 45; P4 No. 3; P5 No. 4; P6 No. 62; P7 No. 87. This will be a 2 hour and 45 minute race. 2:05 pm - Green flag. 2:00 pm - Engine start. The cars are on track for one pace car lap. 1:55 - Five minutes to engine start. 1:44 - On the recon lap, we found a problem with Joerg's radio. They are hustling to get it fixed before Joerg has to get in the car. 1:30 pm CT - The cars are on the grid and pit lane is closed. The cars have completed their recon laps and lined up according to their starting position. Joerg Bergmeister will start in the No. 45, third on the GT2 rid. Seth Neiman will start in the No. 44 - 11th on the grid. The race begins at 2:05 pm CT - engine start and 1 pace lap start at 2:00 pm. The race will be broadcast live on SpeedTV. We are also broadcasting our team radio live - to listen, click on the "Follow the Race" tab at www.lizardms.com. 8:55 am - Good morning from Road America. We are just minutes away from the start of morning warmup. This will be our last run on track before this afternoon's race. Patrick Long is in the No. 45 and Seth Neiman in the No. 44. 9:10 am - The No. 44 pits for driver change to Darren Law. The No. 45 pits for driver change to Joerg Bergmeister. 9:07 am - Patrick Long is currently P4 in the session. The BMWs, as expected, are P1 and P2. The No. 62 Risi Ferrari is P3. The BMWs are running larger restrictors and should show significant speed advantage in this type of circuit with its long straights which require power and speed. The Corvettes are running P5 and 6, although I expect they are not showing all they have right now. 8:55 am - Green flag. Cars are on course. Reminder that we are broadcasting our team radio this morning and during the race. To listen, click on the "Follow the Race" tab on our home page. The race will be broadcast live on SpeedTV. 8:53 am - Good morning from Road America. We are just minutes away from the start of morning warmup. This will be our last run on track before this afternoon's race. Patrick Long is in the No. 45 and Seth Neiman in the No. 44. It's a bit cooler today, with low cloudcover, a strong breeze and the possible thunderstorms predicted for this afternoon. 3:20 - The No. 90 is now P1 with a 2:06.950. The No. 92 is P2, and the No. 45 is now P3. The No. 45 is in pit lane - this is probably it for us for the session - we will save the tires. 3:18 - Joerg is now P 10 on his second lap, with a time of 2:10.781. Compare to the 2:07.943 that Joerg did just 15 minutes ago in practice. No. 87 is still P1. No. 92 BMW is P2. No. 92 BMW moves to P1 with a 2:07.073 (a new GT2 qualifying track record) and No. 92 is P2 with a 2:07.487. On lap 3, Joerg is now P2 with a 2:07.362. He radios in that he doesn't think he has more so he is pitting. The No. 92 is P1 with a 2:07.362. The No. 44 is P 11. 3:14 - The No. 45 is out at the front of the field and we are just hearing the cars go by the front straight now. The No. 87 is P1, No. 21 P2. Joerg did a slower outlap, we should see his next lap significantly faster. Joerg let the No. 87 by but now has the Panoz close behind. It's important to get a clear lap as early as possible in qualifying. 3:10 - Green flag on the 20 minute qualifying session. Joerg Bergmeister will qualify in the No. 45 and Seth Neiman in the No. 44. 3:00 Checkered flag on the session. Qualifying will begin in 10 minutes. 2:46 - Joerg is now fastest with a 2:07.943. 14 minutes left in practice, then we have qualifying immediately following. 2:43 - The No. 92 BMW is now quickest with a 2:08.052. 2:41 - No. 62 Risi Ferrari is now fastest in GT2 with a 2:08.157. Joerg is now second with a 2:08.900. 2:37 - Green flag. 23 minutes left in the session. Joerg is still in the No. 45 and Seth in the No. 44. 2:30 - Looks like the left rear suspension is broken in the No. 16 Dyson prototype after hitting the wall, so we'll be red a bit longer as they flat tow him in. 30 minutes left in the practice session. 2:25 - One of the Dyson prototypes is off in Turn 8 - looks like he may have impacted the wall. driver appears fine although not clear if he will get going again. Red Flag. Just over 30 minutes left in the session. 2:20 - Joerg Bergmeister heads out in the No. 45 for his first run in this session. 2:16 - Patrick pits for tire pressure check and driver change to Joerg Bergmeister and make a few more aero adjustments. 2:10 - The tires are starting to come in and the times are falling. The No. 90 BMW just did the fastest time so far in the session with a 2:09.311. Patrick is currently P6 with a 2:10.425. 2:00- Green flag. Seth and Patrick are on track. We have a one hour combined practice session, then qualifying immediately after that. 1:55 pm CT - Five minutes from green flag on the afternoon practice session. Seth Neiman is in pit lane in the No. 44 and Patrick Long is in the No. 45. 11:24 - Green flag. 6 minutes left in the session. Darren is in the No. 44 and Patrick in the No. 45. 11:16 - Red flag. The No. 02 Challenge car appears to have a tire puncture or an engine/transmission problem and a second challenge car (the No. 47) is deep in the travel. 12 minutes left in the session. 11:11 - Seth pits for driver change to Darren Law in the No. 44. Joerg is also back in the pits for a driver change to Patrick Long and fuel. 19 minutes left in the session. 11:05 - Both cars are back on track. 11:03 - the No. 45 pits for a setup change - ride height. 11:00 - Green flag. The No. 45 is back on track. The No. 44 is getting fuel and will head out in a minute. 10:56 - Another Challenge car is in the gravel. Red flag. 10:54 - No. 45 is back out again. Wolf now has the fastest time of the session so far, a 2:09.202. 10:52 - The No. 45 mechanics are making a clutch repair in pit lane. 10:47 - Joerg is P1 with a 2:09.880. P2 is Wofl henzler in the No. 87 Farnbacher Loles Porsche with a 2:09.986. 10:45 - Joerg radios in that his clutch is gone. They will pit him shortly to check it out. 10:40 - Green flag. We are rolling again. 10:37 am - A challenge car is embedded in the gravel at Turn 12. Red flag. 10:30 am - Green flag on morning practice. Seth Neiman is in the No. 44 and Joerg Bergmeister in the No. 45. 10:20 am CT - Good morning from Road America. Another nice day here - some cloud cover today which should help keep the heat down a bit. There's a chance of some thunderstorms throughout the weekend but hopefully we'll have dry track for our two practice sessions and qualifying today. Our first practice session starts at 10:30 am CT today. Seth Neiman is in the No. 44 in pit lane. The No. 45 has not yet shown up in pit lane but I expect it shortly. 3:43 pm - They will go green shortly and we will be able to do 1 or 2 more laps before the end of our session. 3:39 - Red flag on Joerg's outlap. One of the BMWs is stopped on track.Looks like he might be out of fuel. This may be the end of our session. The No. 45 was second fastest of the session, with a 2:09.402, two-tenths of a second behind the No. 90 BMW. 3:38 pm - Joerg is back out on track. 7 minutes left in the session. 3:35 pm - 10 minutes left in the session. The No. 45 is almost done with their brake pad change. Joerg will need to bed these new pads in. Seth Neiman is now in the No. 44. 3:31 - Joerg is pitting for a brake pad change. 3:20 pm - Joerg is now in the No. 45. Darren is pitting for a setup change. 3:07 pm - Green flag. Just under 40 minutes left in the session. Darren is in the No. 44 and Patrick is in the No. 45. We will change to Joerg Bergemeister in the No. 45 shortly. 2:55 -Red flag. One of the Challenge cars, I think the No. 57 Snow Porsche - is off deep into the gravel after getting bumped by the Panoz. 2:52 pm - Darren is now in the No. 44. Just under an hour left in the session. This is our only practice session today. We have two practice sessions on Saturday, then warmup on Sunday before the race. 2:45 pm - Start of combined practice - the prototypes are now on the track. Patrick is currently P2 in the session with a 2:09.402. the No. 90 BMW is P1. We've spent the last 30 minutes making our basic setup adjustments, bedding in brakes and getting the tires up to temp. Now the engineers will start fine tuning. AT Road America, the engineers have to make sure the cars have enough speed for the straights, but also keep a good aero balance for the fast corners. To do that, they try to minimize downforce, yet leave enough so that the car is predictable in the fast turns. 2:20 pm - Officials told us there was a possible fire in the right rear of the No. 45 - Patrick has pitted so we can check it out. We could not see anything on the TV feed. All is fine, so Patrick is heading out again. 2:15 pm ET - Good afternoon from Road America. The cars are on course for the first official test session today. Seth Neiman is in the No. 44 and Patrick Long is in the No. 45. It's a beautiful day here but hot! We are definitely baking in the Wisconsin later summer sun. This is a long circuit - more than 4 miles and one of the drivers' favorite tracks. It combines long, fast straights with fast and tight corners and elevation changes. 4:45 - Checkered flag. No. 45 wins GT2 at Mid-Ohio. Five in a row for Joerg and Patrick! No. 44 is ninth. Congratulations to the entire team. The No. 3 Corvette is second, the No. 92 BMW is third. 4:42 - The No. 92 passed the No. 4 Corvette on track for position. The No. 92 is now P3. Positions: P1 No. 45; P2 No. 3; P3 No. 92; P4 No. 4. 4:38 - Some switching of positions in the GT2 field - the No. 62 Risi Ferrari and the No. 87 Farnbacher Loles Porsche passed the No. 21 Panoz. The No. 62 is now P5, the No. 87 P6. Five more laps.The No. 44 P9. 4:37 pm - The No. 92 BMW, in fourth, is now chasing the No. 4 Corvette, which is in third. The gap is less than one second. The No. 45 now 22 seconds ahead of the No. 3 Corvette which is in P2. 8 minutes left. 5:33 - GT2 positions: P1 No. 45; P2 No. 3; P3 No. 4; P4 No. 92; P5 No. 21; P6 No. 62; P7 No. 87; P8 No. 90; P9 No. 44. 12 minutes left to go. 5:30 - The No. 62 Risi got by the No. 87 for position - the No. 62 is now P6. The No. 45 may be able to make it until the end without fuel, it will be close. 5:29 - Still green. They have decided to keep it to a local yellow only This is good news for us because a full course yellow could allow the No. 3 Corvette to catch back up - we now have a 15 second lead. 5:27 - The Dyson car spun again in Turn 2 and is stopped on course. he is continuing but slowly, no he is stopped. If he can't continue, we will probably go yellow - he is too close to the track. 5:25 - GT2 positions: P1 No. 45; P2 No. 3; P3 No. 4; P4 No. 92; P5 No. 21; P 6 No. 87; P 7 No. 62; P 8 No. 90; P 9 No. 44. The Dyson prototype got caught up in a pack of GT2 cars and prototypes and spun. He is continuing. 5:20 pm - In the No. 45, Patrick is the fastest GT2 car on track right now. He holds P1 and the gap to the No. 3 Corvette in p2 is now 10 seconds. In the No. 44, Darren Law is now in ninth position. 5:14 - The No. 37 prototype stopped on track but continued. Still green. 5:12 - GT2 Positions: P1 No. 45; P2 No. 3; P3 No. 4; P4 No. 92; P5 No. 21; P6 No. 87; P7 No. 62. Patrick is now 8 seconds ahead of the No. 3 Corvette. 5:07 - The No. 44 will be fine in fuel but I believe the No. 45 still has to stop for fuel. I will confirm that. The GT2 pack is all running together nose to tail but only the No. 3 Corvette and Patrick are on the lead lap. The No. 3 Corvette is stuck back farther in the GT2 pack and is held up in traffic. Gap between him and Patrick is now 6 seconds. 5:04 pm - Green flag. Positions: P1 No. 45; P2 No. 3; P3 No. 4; P4 No. 92; P5 No. 87. Patrick Long is in the No. 45; Darren Law in the No. 44. This yellow did not work in our favor - it allowed the No. 3 Corvette to close the gap from more than 10 seconds to 3 seconds. 5:03 - Much of the GT2 field has pitted for a fuel splash including both Corvettes and the No. 62 Risi Ferrai, which also took tires. The No. 45 has not yet pitted - he has finally reached the pack. it looks like the No. 62, the No. 4 and the No. 92, which had been split from the No. 45 and the No. 3 by the pace car, were able to both pit and also regain the lap that they lost under yellow. 4:56 - Now with the yellow, only Patrick and the No. 3 Corvette are on the lead lap. The No. 4 Corvette is now one lap down, I believe because the field was split when the pace car came out. 4:50 - Patrick in the No. 45 now plus 12 to the No. 3. No. 19 is deep in the gravel. Course will go double yellow. 4:45 - One hour left to go. Patrick Long in the No. 45 holds P1. Johnny O'Connell in the No. 3 Corvette is P2 and Olivier Beretta in the No. 4 is P3. The No. 62 Risi Ferrari is P4. 4:36 - The No. 92 BMW pitted. They are currently in eighth. I believe the whole GT2 field has now done their driver changes. 4:35 - Battle in GT2 right now for third - Jaime Melo in the No. 62 is right behind the No. 4 Corvette and putting a lot of pressure on him. 4:31 - Close call for the No. 45 which managed to scoot through a multi-car incident on track without any damage. He is again P1 - both Corvettes have pitted and positions are: P1 No. 45; P2 No. 3; P3 No. 4; P4 No. 62; P5 No. 92. Patrick is not able to use the clutch and reports that the rear is locking. He is 12 seconds ahead of the No. 3 Corvette. 4:28 - The No. 3 Corvette is now in the pits. Patrick reports a possible problem. The clutch is losing pressure. 4:27 - The No. 4 Corvette is in the pits. In the No. 44, Darren reported that he is in the grass but continued. The No. 3 Corvette has taken the lead. No. 45 P2. 4:26 - The No. 45 is in the pits for tires, fuel and driver change from Joerg Bergmeister to Patrick Long. He is in P1. The Corvettes have not yet pitted. 4:24 - GT2 positions: P1 No. 45; P2 no. 3; P3 No. 4; P4 No. 62; P5 No. 92. No. 44 is P10. The No. 91 BMW went far off track but is back on track - spewing dirt and gravel around the track. 4:23 - The No. 92 and the No. 62 both pitted nearly simultaneously. The No. 62 beat the No. 92 out of the pits and they swap positions - the No. 62 moving into fourth with Jaime Melo behind the wheel and the No. 92 moving to fifth with Drik Mueller behind the wheel. Joerg radios in that he got the bobble - he is switching to reserve and will pit the next lap. 4:20 - Joerg still P1. he is now 14 seconds ahead of the No. 3 Corvette, with the No. 4 Corvette just one second behind the No. 3. The No. 45 will pit shortly for driver change to Patrick Long. Neither of the Corvettes have pitted yet -so they should also do their driver changes shortly. 4:18 - One of the challenge cars went into the tire wall, but managed to drive over the entire gravel trap (!) and rejoined. No yellow. 4:16 - The GT2 cars are starting their scheduled pit stops for driver change, tires and fuel. The No. 87 was one of the first of the group to pit. The No. 44 has already done their driver change. The No. 45 will pit in the next 10 minutes. 4:10 pm - Darren Law is in the No. 44 and is heading out of the pits. Joerg is still P1, he is 14.5 seconds ahead of the next closest GT2 car, the No. 3 Corvette. Positions: P1 No. 45; P2 No. 3; P3 No. 4; P 4 No. 92; P5 No. 62; No. 44 is P10. the two Corvettes are running nose to tail in second and third position. Three's a good battle going on between the No. 40 Robertson Ford and the No. 87 Farnbacher Loles Porsche. Martin Ragginger in the No. 87 has been working to pass the No. 40 Ford for the last 30 minutes and they are nose to tail. 4:08 pm - Seth just got hit on the right rear but he is continuing. He will pit for a driver change, tires and fuel. 4:02- In the No. 45, Joerg now plus 8.7 seconds ahead of the No. 3 Corvette in P2. He is still the fastest GT2 car on track. The No. 21 Panoz jsut had a lengthy off track excursion but was able to get back on track and continue. 3:54 - Joerg is the fastest GT2 car on track right now. In the No. 44, Seth is P10. 3:50 - Joerg reports that he got hit. Doesn't appear to be damage. Positions: P1 No. 45; P2 No. 3; P3 No. 4; P4 No. 92; P5 No. 62; P6 No. 21. Joerg lost a few seconds on that, he is now just under six seconds ahead of the No. 3 Corvette. 3:47 - Hi to the Big Lizard from the team. Seth says congratulations on your Lizard Acura! Reminder that we are broadcasting our team radio. 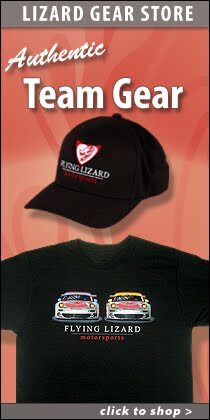 To listen, click on the follow the race tab on the home page www.lizardms.com. Also the team wishes a safe journey for Vanessa. 3:43 pm - GT2 Positions: P1 No. 45; P2 No. 3; P3 No. 4; P4 No. 92; P5 No. 62; P 6 No. 21. 3:40 pm - Rain is increasing. Joerg is now 6 seconds ahead of the second place GT2 car, the No. 3 Corvette. 3:34 pm - In the GT2 lead, Joerg is extending the gap between him and the No. 3 Crovette - he is now 5 seconds ahead. The No. 19 prototype spun on course but continued - no impact. 3:32 pm - The No. 92 BMW got past the No. 62 Risi Ferrari to take third. the No. 62 moves to fourth. 3:30 pm - Joerg is four seconds ahead of the No. 3 Corvette in P2. The No. 3 Corvette has a slight gap ahead of the No. 62 Risi Ferrari in third. the No. 62 is the head of a GT2 train, starting with the No. 92 BMW - putting pressure on him. Joerg reports light rain. Joerg is running the fastest pace in GT2 right now. 3:26 - Joerg is starting to build a gap now - he is still P1 the No. 3 Corvette is P2, the No. 62 Risi Ferrari is P3. The No. 92 BMW is P4. The No. 44 is P 10, having started from the rear of the pack. 3:24 pm - Green flag. 3:22 pm - Seth pits in the No. 44 for a fuel top up. 3:19 pm - Still yellow. Looks like light rain may be starting. 3:05 - On the second start, the No. 3 Corvette, which had started third, passed the No. 62 Risi Ferrari, which had been second. Joerg was able to retain the lead. We are still yellow. It is the 08 Challenge Porsche. I do not know the driver's status - the driver is still in the car and medical personnel are assisting him. 3:03 pm - One of the challenge cars is off far into the gravel. Full yellow. We will come in for a splash of fuel. 3:01 - Yellow - no start. Not sure what is going on. They will form everyone back up and call green again. 3:00 - Green flag. Joerg is in the No. 45, he is on the pole. 2:57 - Engine start. We will have one pace lap. 2:43 pm ET - Good afternoon from Mid-Ohio. We are just a few minutes away from race start. The No. 45 Flying Lizard Porsche is on the pole. Joerg Bergmeister will start the race. the No. 44 will start from the rear of the grid (because Darren Law just arrived last night from Watkins Glen and was not at an official practice session). Seth Neiman will start the race in the No. 44. The big concern at the moment is the weather - we had a wet practice this morning and it's threatening rain right now. Weather reports say it will be a brief shower if it rains at all, but even a short rain will cause us some issues. the race is being broadcast tape delayed tomorrow on NBC sports. Details at www.lizardms.com. Also, we are broadcasting our team radio live during the race. Click on the "follow the race" tab on the home page. 11:15 - Well - this morning's practice was a bust - too wet to do much. We'll be back with you just before the race this afternoon, which starts at 3:00 pm ET. 10:45 am - Good morning from Mid-Ohio. It's raceday! Unfortunately we have some light rain this morning and a wet track. Hopefully the rain will let up before the race this afternoon. Darren Law arrived from Watkins Glen and is out in the No. 44 and Joerg in the No. 45. Darren took a qiuck trip into the gravel on his outlap so red flag. Doeesn't appear to be any damage. They will have to flat tow him out.